As a gardener, I am frequently out there in the dirt (with or without my garden gloves) and have found that good soil can really embed itself in skin and fingernails. I used to use a great hand scrub by Mary Kay… but since I’ve started living crunchier, I thought I would see what I could make from home. I found a good recipe at One Good Thing by Jillee but instead of using the pink Dawn dish soap as she recommends, I used lavender (seemed like a good idea at the time). But the color of the pale purple with the sugar made the scrub a sort of grey color, bleh! And for whatever reason, I didn’t like the way my hands felt afterward. So I tried again…. this time I used peppermint castile soap, sugar and a little bit of safflower oil (the castile and sugar alone felt very drying.) I used 1/2 cup of sugar, 3 Tbs of Peppermint Castile Soap and 2 Tbs safflower oil. This stuff works great, smells fresh and costs very little to make. Next time I think I’m going to make it with lavender castile soap or maybe the unscented and add some essential oils for scent. Another great use of Castile Soap for Handwashing, it is to use a foaming soap dispenser and combination of 1 part soap to 3 parts water. You can also heavily dilute regular liquid hand soap when using a foaming dispenser. After experiencing a bit of “sticker shock” after a foray into the garden store…. somehow all those plants just leaped into my carriage! I decided that I would give plant propagation a try. A few years ago, I got a little “pot maker” that makes tiny pots out of newspaper. They’re very handy in that I can make as many as I want and then when it’s time to transplant the seedlings or cuttings, the paper pot can go right into the soil and will decompose. I used the homemade organic potting soil from the other day, well moistened, to fill the pots. I took cuttings from Rosemary, Sage, Lavender, Thyme and Basil. Dipped the cuttings in a little Rootone and tucked them into the pots. I then gave them a good watering and covered my trays with plastic grocery bags to keep in the moisture. The one bummer about these pots is that I don’t think they would work as well if you tried to water from the bottom, which is what a lot of seed starting and propagating websites advise. I guess I could try it… but with paper pots, I’m not sure how it would go. It’s been a couple of days and the cuttings seem to be doing well. At least they’re not dead yet! I’m not sure how long it will take until they have roots enough to be transplanted… time for some more reading and research. What plants have you propagated from cuttings? Do you have any hints or tips to share? Why Not Use Peat Moss? Just the other day I wrote a post about making organic potting soil with peat moss as one of the major components. Then I started doing some research on Peat Moss. I found that peat moss is not a readily renewable resource at the rate we are currently consuming it. Peat moss is the partially decomposed remains of formerly living sphagnum moss from bogs. Peat moss is mined, which involves scraping off the top layer of living sphagnum moss. The sphagnum peat bog above the mined product is a habitat for plants like sundews, butterwort and bog rosemary, as well as rare and endangered animals like dragonflies, frogs and birds, not to mention the living moss itself. Yes, peat moss is a renewable resource, but it can take hundreds to thousands of years to form. So I started my search for substitutes and found that there are a couple of good ones: Coconut Coir and Leaf Mold. Coconut coir is one material being suggested as a good replacement for peat moss. It’s a byproduct of the coconut processing industry. It’s made from the fibers found between the husk and shell of a mature ripe coconut. The brown fibers are high in lignin and are water-proof.”Coco” doormats and stuffing for automobile seats and mattresses are made from coconut coir fiber. You should be able to get coconut coir at your local garden store, though I haven’t shopped for it since I discovered the other good peat moss substitute is easier for me to get (and free)! 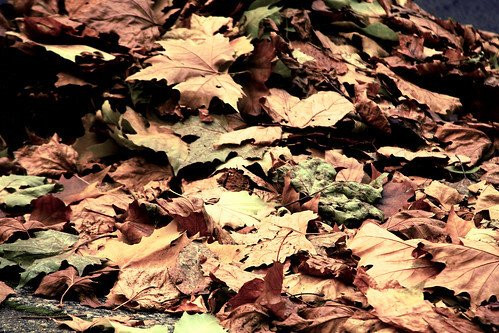 Leaf mold is the result of leaves on the forest floor decomposing. You can’t buy it, but all you need to make it are leaves, moisture and time. I had thought to mix leaves in with my compost, and you can do this to a small degree if you chop the leaves up finely, but the kind of decomposition of a compost pile is slightly different. Leaf mold relies almost exclusively on fungus and compost relies more on bacteria (as well as fungus). At any rate, leaves are something we have plenty of! Unfortunately, it takes at least 6 months to a year to make leaf mold. I did read that you can speed up the creation of leaf mold by layering leaves with some alfalfa meal or other “activator” (I have to look into this more…) But since this giant leaf pile has been growing since 2001, I think I could probably get all the leaf mold I need by digging under and around the edges of it. So, I’m a convert. No more peat moss for me. It’s leaf mold all the way for my organic potting soil. I read that leaf mold makes a really nice mulch for perennial beds too. Based on the number of times I’ve written about homemade laundry detergent, one would think I just love laundry… but no, it’s actually my nemesis. It is one of those household tasks that is endless. You no sooner get all the clean clothes put away and the hamper is overflowing again. The worst is when I’ve put off doing laundry for so long that the whole family is running out of clean underwear. My Mom gave me a tip years ago to buy enough underclothing for everyone in the family so you get a little extra time… I think we all have at least 1+ weeks worth, but somehow I still get behind! Anyway, today’s post is another version of the homemade powdered laundry detergent I made a month or so ago. I had used Fels Naptha laundry soap along with Borax and Washing Soda. However, Fels Naptha is not as readily available as Ivory Soap in the grocery stores where I shop. So I made a variation. Since Fels Naptha is specifically a laundry soap and Ivory Soap is not, I added another ingredient, OxiClean. I use the OxiClean spot cleaner on stains and it works beautifully. Just like with my other recipe, you only need 1-2 small scoops (tablespoons) per load of laundry. So far, it’s working great. Easy to make, VERY inexpensive, cleans the clothes and doesn’t irritate my sensitive-skinned family. Speaking of laundry… gotta run, another load is ready to go into the dryer…. I love the Mr. Clean Magic Eraser for cleaning tough spots… like the persistent mildew we seem to get in the shower of our master bathroom. The previous owners painted over the 1970′s green tile with white paint. While it made a great first impression when we were buying the house, not only has the paint started peeling away, but also gets terrible mildew that seems to seep from under the paint. However, since getting the shower sparkling clean (especially this time of year when the humidity and moisture seem to make the mildew explode) takes an entire magic eraser, and they cost about a dollar each (and that’s on sale! ), I thought it was time to find a better way. I started doing a little research on making “homemade” magic erasers and quickly found that the secret to the magic eraser is not some super-duper chemical formula, but is actually that they are made of Melamine Foam. In the early 21st century it was discovered that melamine foam was an effective abrasive cleaner. The open-cell foam is microporous and its polymeric substance is very hard, so that when used for cleaning it works like extremely fine sandpaper, getting into tiny grooves and pits in the object being cleaned. On a larger scale the material feels soft. Rubbing with a slightly moistened foam may remove otherwise “uncleanable” external markings from surfaces. Ah ha! So, now all I need to do is find a less expensive substitute. As it happens with many things, buying something “generic” vs. the “brand name” is probably the best way to approach this. When shopping for substitutes, you have to pay attention to size… some of the melamine foam substitutes being sold on Amazon are very small, like the 30 pack of sponges for $14, only 46 cents each. The dimensions are 3.5 by 1.5 by .6 inches. The dimensions of the Mr. Clean Magic Erasers are 5 x 2.5 x .75 inches, that’s a big difference in size. I found a wholesale source online (dhgate.com), that sells melamine foam sponges for about 11 cents each. They are smaller than the Mr. Clean brand, but not by too much, they are approximately 4 x 2.4 x.75 inches. An inch shorter and slightly less wide, but the same thickness. I just ordered some today. I’ll let you know how they work out. I had a couple of sticky things to deal with this morning, glue residue left after taking the label off a plastic bottle and sticker residue left on a polyester sport shirt that inadvertently got washed with the sticker still on. Let’s start with the bottle label. I had a great plastic bottle left over after finishing up my Dr. Bronner’s Lavender Castile soap. But after pulling off the label I was left with a lot of sticky residue all over the bottle. It’s kinda hard to see in this pic, but believe me, it’s there. So I went online for a little research and found that Eucalyptus oil, rubbed onto an adhesive residue will remove it quickly and easily and it smells great. However, I recognize that not everyone has essential oil of Eucalyptus hanging around, so I decided to try another recommended method, vegetable oil. I coated the bottle with vegetable oil and let it sit for about 1.5 hours. Then I came back and rubbed on the label residue. The oil had definitely started to do something to soften it, but it just all mushed around as I rubbed instead of coming off. So, I let it sit another hour or so (of course the website I got the instructions from said to let it sit overnight, I just didn’t have that kind of patience!). So after another hour, I tried again and yes, Voilà! The sticky label residue rubbed right off and now I have a lovely clean, clear bottle that I can reuse for body oil, homemade shampoo, or whatever. The other day I bought a package of sunscreen for our son to take to camp. It was a 2 bottle set with a small spray bottle of sunscreen and another small bottle (4oz.) of sunscreen lotion. It cost $10.99, which was supposed to be a great “promo-price.” I’m either very behind the times, which is entirely possible, or that’s an awful lot of money for 2 little bottles of sunscreen. One of the main, and most effective, inorganic compounds in sunscreen is zinc oxide. So, I thought, what the heck, maybe I should try making my own sunscreen. 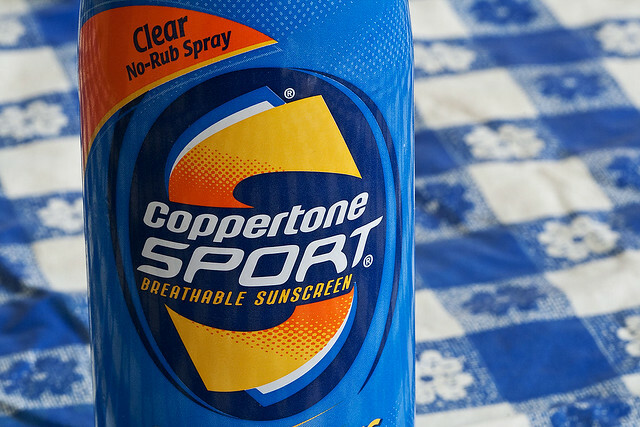 As it happens, both our children have very sensitive skin and to date have only been able to use Coppertone’s Water Babies (even though at 13 and 16, they are hardly babies). This was another reason to try a homemade version. Well, Hooray! Couldn’t be easier, right? And as long as we are not allergic to Zinc Oxide (which you can get very inexpensively at Bulk Apothecary), I can just mix some in with lotion that we know won’t give anyone a rash and we’re in business. Once the zinc oxide arrives, I’ll mix up a batch and put up a quick tutorial on Hubpages. If you have recipes for homemade sunscreen that works, please comment. Thanks. The only place I did NOT reapply sunscreen was on my back. The homemade Sunscreen side of my back definitely got redder than the Water Babies side. Other parts: arm, chest, leg where I used (and reapplied) the homemade sunscreen were great even after 3 hours on a scorcher of a day. Conclusion: Homemade Sunscreen needs to be reapplied more frequently than commercial Sunscreen.